Belief training package for FREE and save £995! All of the indications are that more people will need to continue working later in life. This is because on the one hand pensions are decreasing in value and on the other, people are becoming more likely to still have financial obligations such as mortgages or child/student support, later in life. Because there are also fewer younger people available for work. Employers will need to consider how they can best become an employer of choice for older workers and how they can retain older workers in an increasingly competitive market place. Employers will need to review their HR practices and procedures and arrangements for training to ensure compliance with the Employment Equality (Age) Regulations 2006, but also to ensure that all employees including younger and older workers are respected and valued in a workplace that is attractive, responsive to their needs and optimizes their opportunity to contribute. For some organisations this will mean a significant culture change. Consider that 25-34 is the current favourite recruitment age of employers and The Employers Forum on Age has estimated that ageism costs the UK economy over £26bn each year. 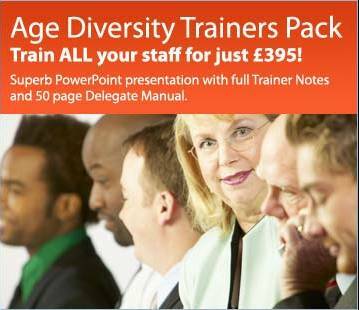 Diversiton’s one day course ‘Age Diversity’will help you to explore the issues that affect your capacity to be an age positive employer and help you to identify the steps you need to take to fully comply with the Employment Equality (Age) Regulations 2006. What do we mean by ageism? Ageism is a negative bias against a person or group of people on the grounds of age. Ageism is usually focused on two targets: young adults and older adults but ageism can affect employees of any age. Ageism includes attitudes and actions which relegate or treat as “not as good” a person or group for no other reason than their age. Research shows that women are likely to experience the effects of such attitudes and actions before the age of 21 and over the age of 40 and that men under 18 and over the age of 50 are similarly affected. There is significant evidence that society has a stereotypic and often negative perception of older people – which impacts on many areas of life and demonstrably affects the attitude to older adults as part of the workforce. People are being judged on the basis of their date of birth and a battery of ill-informed perceptions and myths determine the judgements that are made. These stereotypes are evident in areas such as language, where – for example phrases such as “over the hill” and “don’t be an old fuddy duddy” denote older adults as impotent and incompetent and in media and humour where a visit to any card shop to scan the birthday section for fifty, or even forty plusses, clearly demonstrates the range of stereotypes. Jokes about the elderly are usually concerned with cognitive decline, death and sexual ability and interest. Estimates of the cost to the economy of ageism in employment range from £16bn to £31bn every year and without appropriate action could become much higher. Of course there are also positive stereotypes. Younger workers may be seen as more energetic, adaptable, and open to new ideas. Older workers are often seen as more conscientious, self-assured, experienced and dependable. These may encourage employers, in particular work environments, to favour employees of a particular age group and may, in itself, contribute to ageism. Interestingly, in the case of older workers, negative stereotyping is invariably the dominant influence and a number of explanations for this have been suggested. Ageism is not a universal, cross-cultural phenomenon. There is evidence of great variations in the attitudes to and treatment of older adults – ranging from enormous respect and reverence to abandonment and deprivation. In general, attitudes towards the elderly decrease with increasing modernization – culminating in the generally negative view in industrialized western nations. So why does this negative bias and stereotyping occur? Unlike in Eastern philosophy where life and death are all part of a continuous cycle, in Western society, death is not accepted as a natural and inevitable part of the life course and is therefore, generally feared. Because death is feared, old age, most usually the stage before death, is feared. The media, books, newspapers and magazines tirelessly promote youth, physical beauty and sexuality. This emphasis on youth and physical appearance, it is argued diminishes and demeans being older. People in general, and women in particularly also feel under pressure to look young “for their age,” which is in itself a form of ageism. Productivity is broadly viewed as economic potential. Both ends of the life cycle –children and the elderly – are viewed as unproductive and a “cost” to those who are working and earning. This is accepted for children who have future economic potential but devalues older adults if it is felt that they will never again contribute economically. Some of the research studies into ageing which have, in the past, concentrated on those least able and been carried out in long-term care institutions, where the elderly were easy to find, inappropriately reinforced negative images of the older adult. The need to change negative attitudes and perceptions towards older age, is complicated and hampered by the way in which many older adults view old age. There is much anecdotal evidence that, for many individuals, their concept of themselves becomes less positive as they become older. It would, in many ways, be surprising if people who have for all of their lives shared a negative societal view of old age, automatically became very positive about ageing as they became older. The risk is that this leads to negative attitudes to age and ageing becoming self fulfilling. One of the starkest illustrations of how this translates, in practice, is the lengths to which women are prepared to go in investing in expensive products, cosmetic surgery and other invasive procedures to avoid becoming the sexless old woman which is a common theme in humour and greeting cards. There is, however, no empirical data to support the stereotype of the asexual, dependent older woman. Ageism and age discrimination lead to under-achievement, reduced self confidence and motivation, lower self esteem and loss of status which sooner or later anyone of us can, and many of us will, be affected by.